Detection of Human Fc (CH2) using HRP conjugated Mouse anti Human Fc specific antibody (MCA647P) in an Adalimumab sensitivity ELISA. 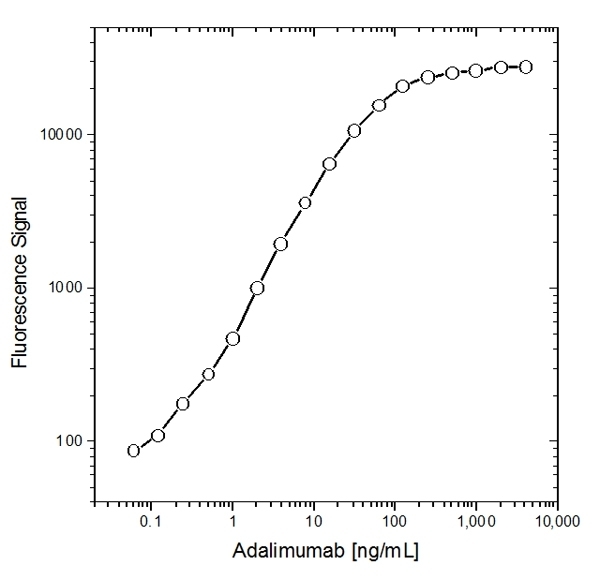 Human anti Adalimumab (HCA202) was used as the coating antibody followed by Adalimumab (D2E7) at the given concentrations as the antigen. Mouse anti Human IgG (Fc) CH2 domain antibody, clone MK 1 A6 used for the detection of CH2 by flow cytometry. (A) Selection strategy for the generation of pH-dependent binders. A yeast displayed Fcab library was incubated with 3 nM biotinylated Her2-ECD, followed by labeling with SA-PE and anti-CH2-FITC. The incubations were either performed at pH 7.4 (selection rounds 1, 2, and 5) or at pH 6.0 (rounds 3, 4, and 6). 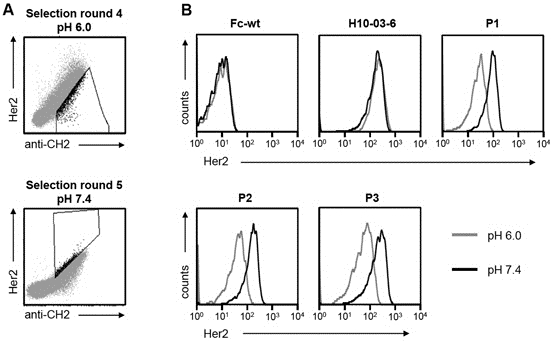 If the staining procedure was done at pH 7.4, the cells were subsequently sorted for binding to Her2, whereas incubation at pH 6.0 was followed by selection of non-binders. Exemplarily, the dot plots from selection rounds 4 (top) and 5 (bottom) are shown. The boxes within the plots indicate the gates that were used for sorting. (B) Analysis of the pH-dependence of Her2-binding of selected Fcab mutants. After six rounds of flow cytometric sorting, individual Fcab-clones were analyzed. Fcabs were displayed on yeast and incubated with 3 nM biotinylated Her2, followed by detection of antigen binding with SA-PE and of the surface display level with anti-Xpress-APC (recognizing an N-terminal expression tag located between Aga2p and the Fcab). Incubation steps were either performed at pH 6.0 (gray lines) or 7.4 (black lines). Only Xpress-positive (i.e. displaying) cells were analyzed. In total, 10 Fcabs that have been enriched during selection were tested for pH-dependent Her2 binding. Only the three best performing clones (P1, P2, and P3) are shown. From: Traxlmayr, M. W., Lobner, E., Hasenhindl, C., Stadlmayr, G., Oostenbrink, C., Rüker, F. and Obinger, C. (2014), Construction of pH-sensitive Her2-binding IgG1-Fc by directed evolution. Biotechnology Journal, 9: 1013–1022. Mouse anti Human IgG (Fc) CH2 domain, clone MK 1 A6 recognizes human IgG Fc (all subclasses). CH2 and hinge regions have an important role in effector functions of IgG. The epitope detected by clone MK 1 A6 lies within the CH2 domain as determined by haemagglutination and western blotting using IgG heavy chain and myelomas with defined domain deletions. Spleen cells from BALB/c mouse were fused with cells from the mouse NS1 myeloma cell line. Lund, J. et al. (1996) Multiple interactions of IgG with its core oligosaccharide can modulate recognition by complement and human Fc gamma receptor I and influence the synthesis of its oligosaccharide chains. J Immunol. 157 (11): 4963-9. Wozniak-Knopp, G. et al. (2010) Introducing antigen-binding sites in structural loops of immunoglobulin constant domains: Fc fragments with engineered HER2/neu-binding sites and antibody properties. Protein Eng Des Sel. 23: 289-97. Raghuraman, S. et al. (2012) Spontaneous clearance of chronic hepatitis C virus infection is associated with appearance of neutralizing antibodies and reversal of T-cell exhaustion. J Infect Dis. 205: 763-71. Hasenhindl, C. et al. (2013) Stability assessment on a library scale: a rapid method for the evaluation of the commutability and insertion of residues in C-terminal loops of the CH3 domains of IgG1-Fc. Protein Eng Des Sel. 26 (10): 675-82. Rasti, N. et al. (2006) Nonimmune immunoglobulin binding and multiple adhesion characterize Plasmodium falciparum-infected erythrocytes of placental origin. Proc Natl Acad Sci U S A. 103: 13795-800. Traxlmayr, M.W. et al. (2014) Construction of pH-sensitive Her2-binding IgG1-Fc by directed evolution.